how many dogs do you got under the porch? I will shoot a tiger! ANNE BOYER was born in Topeka, Kansas, in 1973. She is the author of The Romance of Happy Workers (Coffee House Press, forthcoming 2008), Selected Dreams with a Note on Phrenology (Dusie Collectif, 2007), and Anne Boyer's Good Apocalypse (Effing Press, 2006). 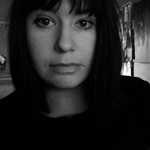 Her work has appeared in The Poker, Denver Quarterly, The Canary, Painted Bride Quarterly, and other journals. She now lives in Overland Park, Kansas (a suburb of Lawrence), where she edits the poetry magazine Abraham Lincoln with K. Silem Mohammad.